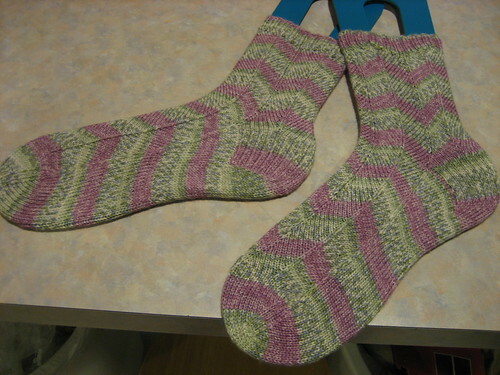 This is of course the Jaywalker pattern in Serenity sock yarn, which I found at Joann's while shopping with my mom. It is wool, nylon, and bamboo, and is part of the Deborah Norville yarn collection. She also has sport weight, worsted, and chunky, but they all seem to be acrylic/nylon blends. 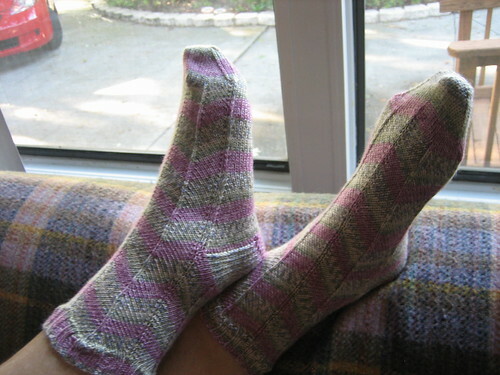 The sock yarn is the only wool blend in the collection. I thought it was funny that she's got her own yarn line too! I didn't know she was into knitting and crochet a la Vanna White. Those of you who may know her name but be fuzzy on 'from where' can investigate more at her official website. She's a tv presenter/'journalist'. 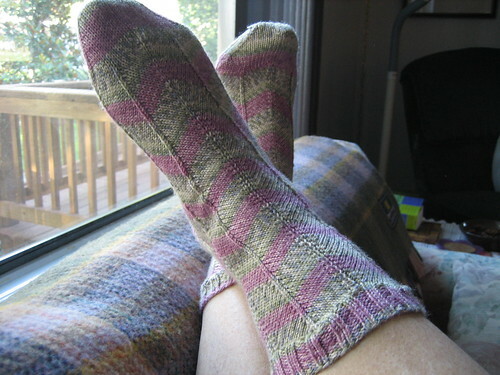 Anyway, I wanted to make socks for my mom, but she lives in Florida, so wool socks are not really necessary or desirable. In fact, the only modification I made to the pattern was to make the cuff only 5" rather than 7" because shorter socks are better for that climate. I also have some cotton yarn in the stash, which I'll use later, but this Serenity stuff is super-light, and really soft. It splits, but I love how muted the colors are. Even in the darker colorways which you can see at the link above, are all really muted and soft. Anyway, the socks fit her and she loved them. I definitely am joining the ranks of the thousands of people who love this pattern and I'm sure this won't be the last time I knit it, since I still have tons of self-striping sock yarn in the stash, and was getting burned out with just knitting plain stockinette socks.